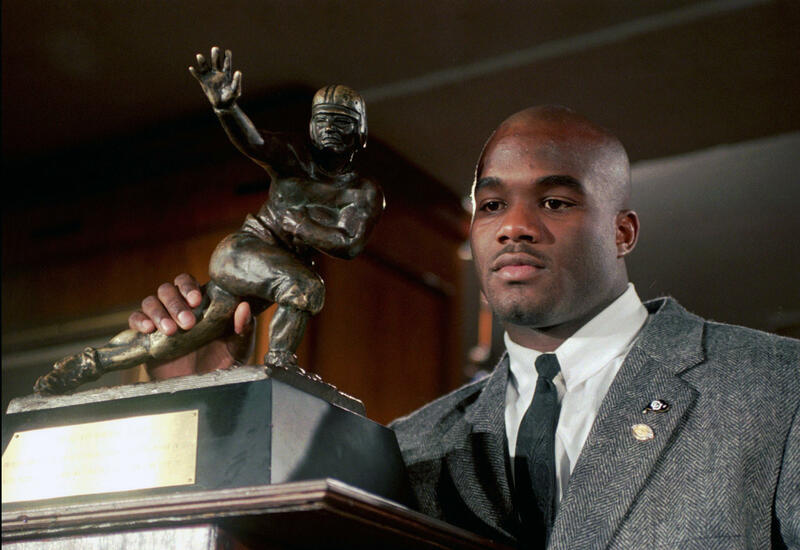 DENVER -- Heisman Trophy winner Rashaan Salaam killed himself after struggling with depression, an autopsy report confirmed Thursday, but investigators will never know whether the one-time running back suffered chronic head trauma from playing football because his family did not consent to those tests. Salaam was found dead Dec. 5 in a park near the University of Colorado, where he played from 1992 to 1994, becoming one of the greatest players in the program’s history. He was 42. Salaam was Muslim, and Islam prohibits bodies from being defiled after death. His family did not allow the coroner’s office to perform tests that would have revealed whether he suffered chronic head trauma from playing the game. Although the report notes significant damage to Salaam’s brain as a result of the gunshot, investigators said testing even a small part of it would have allowed them to see evidence of traumatic injury. Repeated blows have been linked with a degenerative brain disease called chronic traumatic encephalopathy. CTE first made headlines several years ago when it was found in the brains of retired NFL players who had killed themselves. Salaam had been drinking heavily and using marijuana before his death. The report said Salaam had a blood-alcohol content of 0.25, more than three times the legal limit to drive. Salaam won the Heisman in a runaway in 1994. He led the Buffaloes to a win over Notre Dame in the Fiesta Bowl that season and a No. 3 finish in the final polls. The Chicago Bears made him a first-round draft pick in 1995, and he rushed for 1,074 yards and 10 touchdowns in winning NFC Rookie of the Year honors. Injuries cut short his career. He only scored three rushing TDs in the next two years in Chicago and played his last NFL game with the Cleveland Browns in 1999. Salaam played for the Memphis Maniax of the defunct XFL and attempted one last comeback with the NFL before retiring. Colorado players plan to honor Salaam by wearing his initials and number on their helmets Thursday night when they play Oklahoma State in the Alamo Bowl in San Antonio.